Reviewer’s Note: This review will not read like most because it will have large segments of parenthetical comments highlighted in bold print. As I was fairly finished with writing the review of the LFT-8A’s, Bruce Thigpen of E.T. shared with me that an upgraded tweeter was in the works, thus launching the “LFT-8B.” Having thoroughly acquainted myself with the speaker, I suggested that I do an in-the-field replacement and finalize the review of the transformed speaker. What has resulted is this review of the two editions of the LFT-8 speaker, versions A and B. One advantage of this format is that you will see the original review of the LFT-8A in its entirety, while descriptions of my impressions regarding the new version will be close at hand for comparison. An appreciation will be gained hopefully for a reviewer’s caution not to pronounce a technology or product the “ultimate”, since virtually any component can be improved. Finally, it will stand as an example of the benefits of “in the field” upgrades to components. The primary text, pertaining to the LFT-8A, was written as a distillation of more than six months with the speakers. The post-upgrade impressions are recent as an attempt to capture the essence of the improvement in sound before I utterly forgot the performance of the older model. Since it was not feasible to swap tweeters (re-soldering the old tweeter would be required to reinstall it), I tried to work quickly but thoroughly to make the final comparisons between the two versions of the LFT-8 speaker. I had to beg for this review. I actually groveled before Bruce Thigpen, admitting to him that I’d made a big mistake. I had sold the pair of E.T.’s that I owned and now I wanted to get another pair. To be technically correct, I had owned two pairs which I used in a “stacked” configuration. What got me going on that audio adventure was an article which mentioned that stacking the LFT-8A’s was reminiscent of the reference Infinity IRS V system of the 1980’s. I used 8 channels of amplification to passively biamp the four E.T.’s. It was awe inspiring, some of the biggest sound in two channel home audio I’ve ever heard, including the Magnepan Tympani’s. I had some of my most enjoyable times in audio with the enormity of it all. It was too much, however – too much hugeness and not enough focus. I began to miss the finesse and detail of a finely tuned system. Looking back, a large part of this was likely due to the moderately priced cdp and amplification, and an inadequate cabling scheme. In one of those fits of audiophile dissatisfaction, I sold the entire system in an effort to rebuild from scratch. I went the opposite direction, from planars to dynamic speakers, from multi-amping to single amp, from solid-state to tubes. In the process, I lost some very good speakers. Later, recalling my enjoyment of them, I called Bruce and asked his forgiveness. I like Bruce; he didn’t hesitate to ship me a pair for review! I already knew a fair bit about the speakers from previous experience, but I was to learn there was much more to them. I should have known. Bruce is one of those very clever guys. Having produced audiophile components for more than 25 years, he’s proven that his designs have staying power. He’s chosen not to bombard the audiophile community with advertising. According to Bruce, Eminent Technology is, “…heavy on R&D, and light on Advertising.” With the evident quality of the product, I feel he’s largely made the correct choice and avoided some of the pitfalls that have befallen many a fine company (Agreed. Just don’t cancel the entire advertisement budget. –Ed). He’s smart, because when a product is so good that it sells itself largely through word of mouth, it’s enough to keep a small business going and keep the demand manageable. The Eminent Technology products are good enough to do exactly that. The result is a smaller business in which it is possible to speak to the man who designed the very component sold. It’s also very good for the audiophile, since Eminent Technology has not been relentlessly pressured by a board of officers pushing for changes to be made in order to increase margins. The LFT-8A speakers are built the way Bruce wants them, and priced the way Bruce wants, and that’s very good for audiophiles with budget limitations. Bruce has his fingers in enough audio components to keep a small army of audiophiles happy. He worked on the Coloney AB-1 air bearing turntable, which was later used by Mapleknoll. Eminent Technology was formed by Bruce to pursue building an air-bearing tone arm, the most popular version of which was the ET-2. It lives on today as the ET-2.5 with an optional carbon fiber arm wand. In addition, to the above, he’s worked on the Monsoon brand speakers and designed an intriguing Rotary Woofer, which looks disturbingly like one of those old fans without cages that can cut the fingers off a curious child – named unsurprisingly, the TRW-17. I wonder if Bruce will ever see the “20’s” in naming his products? I think he’s too modest; to break the barrier, I suggest that he cut loose and name his next speaker the “LFT-100,000”! The Linear Field Transducer (LFT) speakers have stood the test of time as niche favorites among planar fans. Well they should, for at the paltry price of $1,499 (Note: This is the pre-upgrade price; the LFT-8B is $1,899) one may not get more for their money in any speaker purchase under the sun. That almost sounds like a concluding line for a review, so I guess I’d better start backing up my conclusion. How about starting with the build quality? LFT-8B Comment 1: My feeling regarding price to performance has strengthened, if possible, after the upgrade! The LFT-8A’s are second generation bipolar planar hybrids, having magnet arrays straddling front and back of the tweeter and midrange drivers. 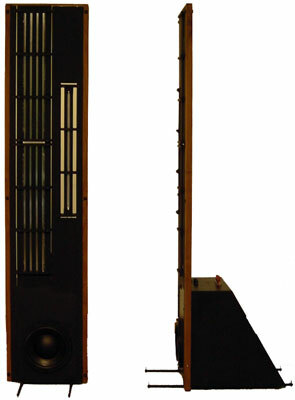 The earliest LFT-8 model had the tweeters at the top, whereas on the 8A’s they are mid-cabinet. Improvements to the 8A’s included an outboard tweeter level jumper, to switch between low, mid, and high settings (on the LFT-8 this was located inside the woofer module – not the most user-friendly location) and an improved woofer. Encased in industrial strength cross-braced metal frames to freeze the magnet arrays in position, the mids and tweets look more like security bars across a basement window than speaker drivers. In the classic LFT-8A design, eight ceramic magnets are used, but Bruce has developed a new optional tweeter with neodymium magnets. (Little did I know at the time this was written that I would be a recipient of these neodymium wonders…) Below, resides the 8” proprietary woofer, which we’ll return to in a moment. The frequency range of the drivers is: woofer 25 – 180 Hz, mid panel 180 Hz – 10 kHz, and tweeter 10 kHz up. From the front with their grills on, the speakers do a passable imitation of a skinny monolith from the movie 2001 A Space Oddyssey – a tall, black obelisk. It’s the sides that get interesting, with pleasant oak (natural or black) trim and the unorthodox rear woofer chamber. It’s both a solution and a problem. It’s the solution to augmenting notoriously deficient planar bass, and it’s the problem with the speaker’s appearance. One might go so far as to say that the sound of these speakers is inversely proportional to their WAF. My guess is that scads more ET’s would be sold if something could be done about the appearance of the speakers. I’m sure WAF kills who knows how many purchases of these fine speakers. The fact that they are so utilitarian in appearance is testimony to the determination of Bruce to produce products that are driven by sonic considerations, not aesthetic (Anyone who comes up with a Mother of a Subwoofer capable of well below 10Hz with an appearance of a fan is not a slave to aesthetics!). But not all is lost, as there is also available beige grill cloth. I need to know power and preamplifier match to EMINENT TECHNOLOGY LFT-8B. OHHHHHhhhhh…. a great review. I often think Doug just kinda skims over products (ie DACS) but I really think he has done an exceptional job of reviewing these speakers! I have to admit that I am tempted to buy a pair of the new LFT 8B’s and compare them to my very wonderful 1.6 Magnestand’s. Doug you done good! I own a pair of LFT 3 from 1987 and have upgraded the crossover and cabling. I use a Wells Audio Innamorata amp (200wts in 4 ohms) and it is plenty to drive them to very realistic levels. No preamp apart from the level preamp built in my Benchmark DAC 2. Still very hard to beat, sound wise. Charlie, I had to laugh a bit when you said I skim over products like DACs! If you knew the hours I put in on extra exploration of a product, especially opamp rolling the Eastern Electric DACs! It could be a second job! 🙂 Glad you enjoyed the LFT-8 review. irenee, you should have a lovely combo with the Wells amp and Benchmark DAC2. If you haven not, spend some time working with various power cords, interconnects and speaker cables, as this will reward you.